The baking cinnamon challenge is on! Want to take part in a cinnamon challenge? No, I don’t mean the stupid one where the challenger is filmed ‘swallowing a spoonful of ground cinnamon in under 60 seconds without drinking anything, then upload the video to the Internet. ‘ I’m talking about the baking kind. I’ve previously mentioned the jar of cinnamon a friend bought me whilst on a recent trip to Costco. I don’t want to waste any of this spice so have decided to try and make at least one baked treat a week that contains cinnamon. 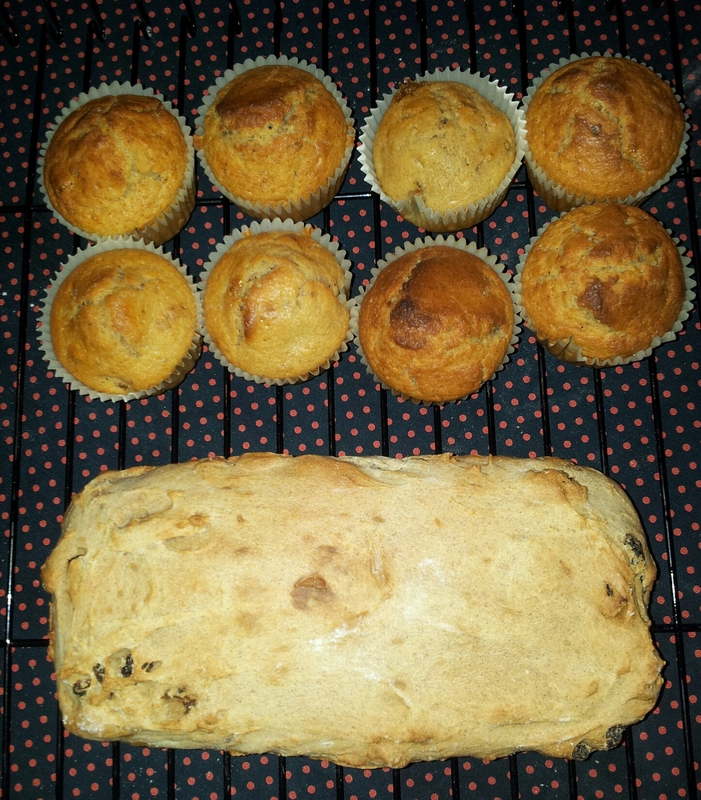 I’ve kicked started off this self imposed challenge with a walnut and cinnamon muffin, and a sultana and cinnamon bread. The muffins were a first for me and turned out well. There bread, though pretty looking is a bit on the dense side. Every time I try to make this bread something goes a bit wrong hence the brick effect this time round. Even though my ‘bread’ did turn out stodgy and could be used as a weapon according to my taste testers the flavours were there and weren’t adverse from taking another bit. I have not given up hope of making a decent cinnamon bread, it just didn’t happen this time. Another plus side of baking with cinnamon is my house smelt nice and dare I say it, even a bit homely and cosy whilst the weather outside had turned nasty with wind and rain! I really need to work on choosing ‘nice’ backgrounds for my baking pictures, in my defence it was about 9.30 and I my adrenaline levels were nearly depleted. Ok, that sounds more like an excuse but…hmm it’s the best reason I’ve got for now! I will post the recipe I used for the walnut and cinnamon muffins at some point. I have some cinnamon related recipes to keep me going for now I just hope I and whoever become my guinea pigs don’t get sick and tired of cinnamon or develop some kind of allergy to the spice! I’ve already inspired a work colleague to take part in the cinnamon challenge, or I should say his wife who he texted asking for some cinnamon related baked goodies. Week 4 cake decorating course / Muffin Monday. 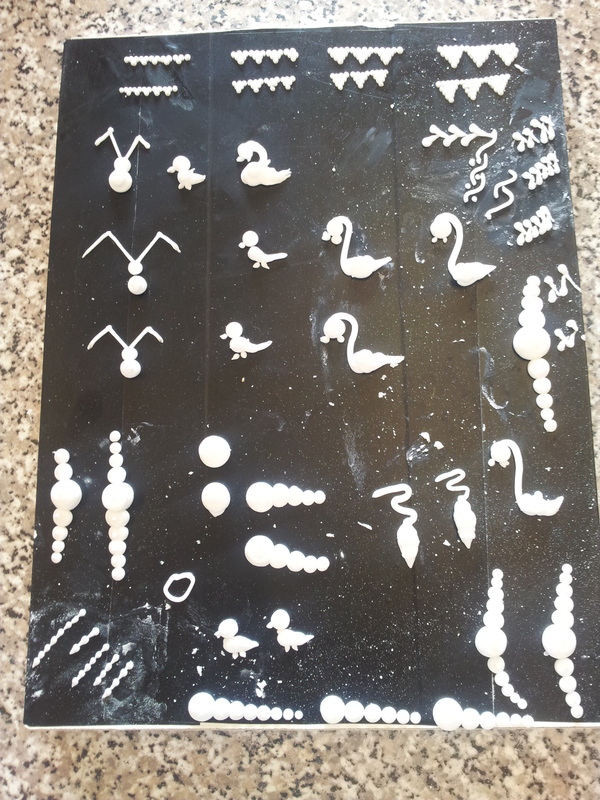 This week’s class was spent taking our piping skills to the next level and piping animals and objects out of royal icing using a plain nozzle. From the pictures you can see the teachers duck and swan look very elegant. I was getting the hang of the ducks, but my swan just looked like a creature from another world – a swan with fangs! It all comes down to practice something I need to start doing at home. Apart from the class which went well the rest of the weekend was a bit of a baking disaster. Don’t ask me why but I got it into my head that I was going to have a go at making jam. Let’s just say Martha Stewart I’m not! I think I overworked the jam it’s become hard and more like boiled sweets and not the traditional jammy consistency. 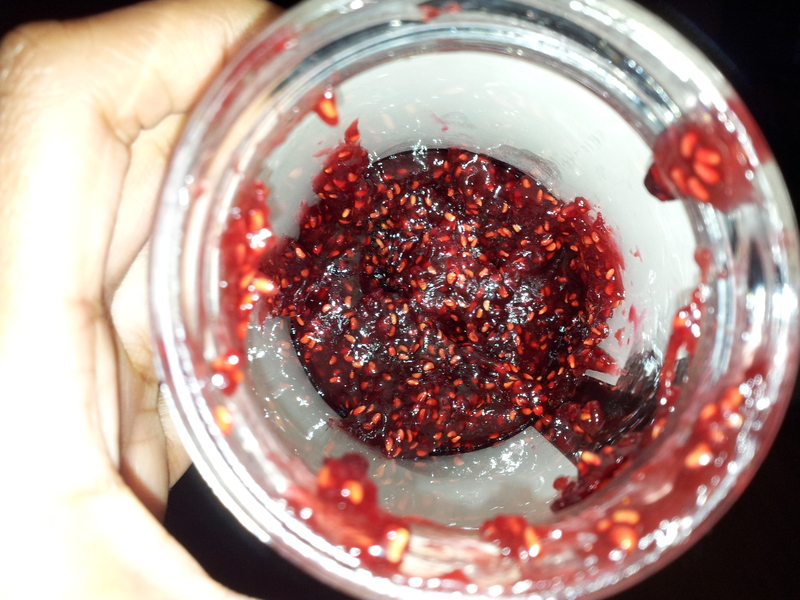 It did taste nice before I put it into the jar and became a rock, my next task will be to get it out of the jar! I experimented with making apple and cinnamon muffins. Tasted ok, bit dry and crumbly. The chocolate muffins, a recipe I found online, well they looked a bit pitiful and the chocolate chips sunk to the bottom but tasted really good. 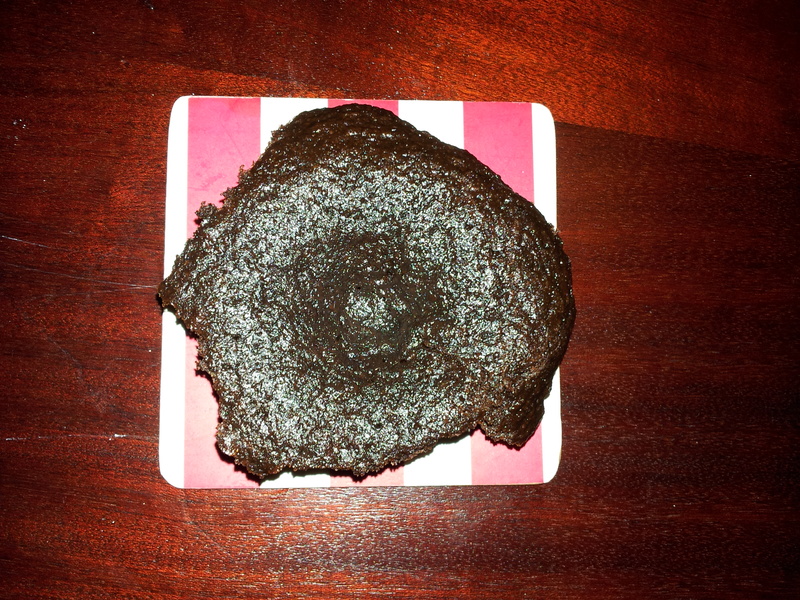 I don’t think my oven was hot enough hence a concave look. I’ve found a new recipe for the apple and cinnamon muffins and will give the chocolate muffin recipe another try. I normally use the usual self raising and plain flour but one of the girls I work with has a gluten free diet, so I usually have gluten free products lying around. If it wasn’t for the fact that gluten free flour is so much more expensive than normal flour I would probably cook with it all the time. It would make life easier. This past weekend’s cake decorating class went well. 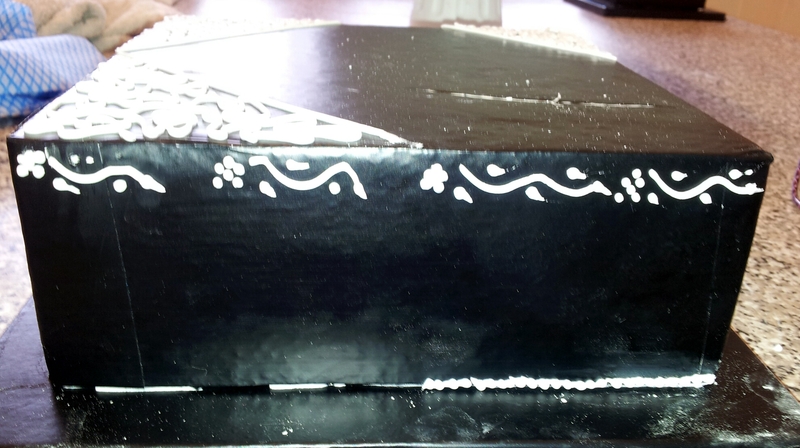 I definitely need more practice with my piping skills, but I am getting there little by little. Although it is a bit of polystyrene I’m thinking of investing in a dummy cake and using it to practice on. 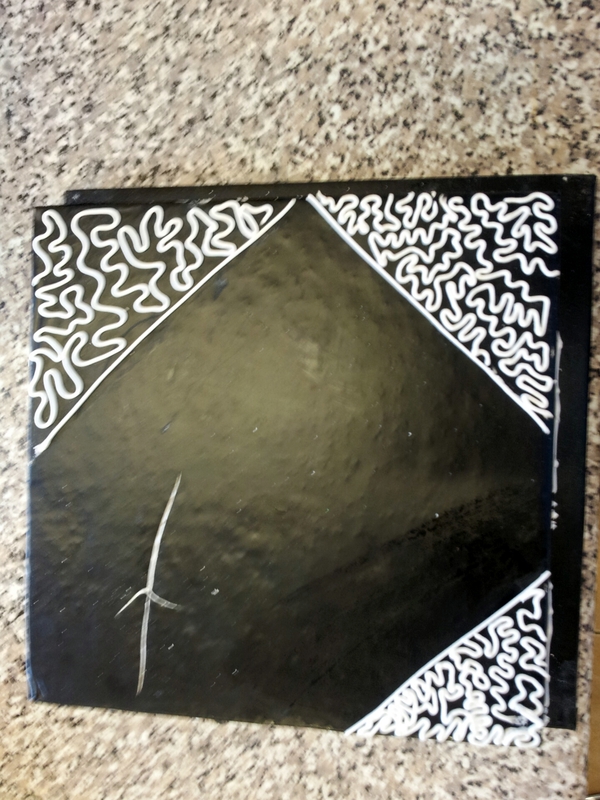 Practicing on a flat surface it very different to practicing on a cake, the shape and angles are all different. Not working on the actual cake just yet, we are still in the process covering the cake in a number of layers of royal icing to get that polished look. This takes a bit of time as we leave the icing to dry ready for the next layer. Have to admit that I am getting better smoothing off the cake, last time my hands wouldn’t spread out enough on the smoother to give an even look, this week my child like hands decided to do as they were told. Two hours of piping was more than enough as my hands started cramping up. Though I am thinking this could be a nice technique to use on my sister’s baby shower cake (which I will hopefully get round to making!). As much as I like baking cupcakes and decorating them they can be time consuming whereas muffins, two bowls mix the wet ingredients with the dry using a wooden spoon, spoon into the cake cases and bake for about 20-25 minutes. Perfect to fix the sugar pangs, and to go with steaming mug of tea. 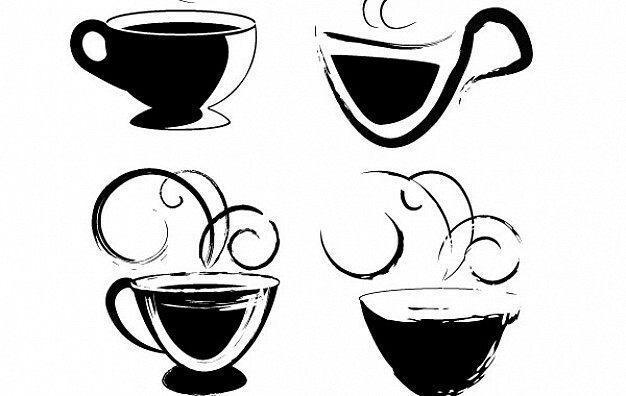 I know I have a tea problem, some would go as far as to say it’s an addiction but who cares, if it gets me to function enough throughout the day that’s good enough for me! I tried out a cinnamon muffin recipe and brought them into work on Monday. I clearly hadn’t made enough as they were gone within half an hour! I’m going to make up another batch also adding some sultana’s and apple to see how they go. 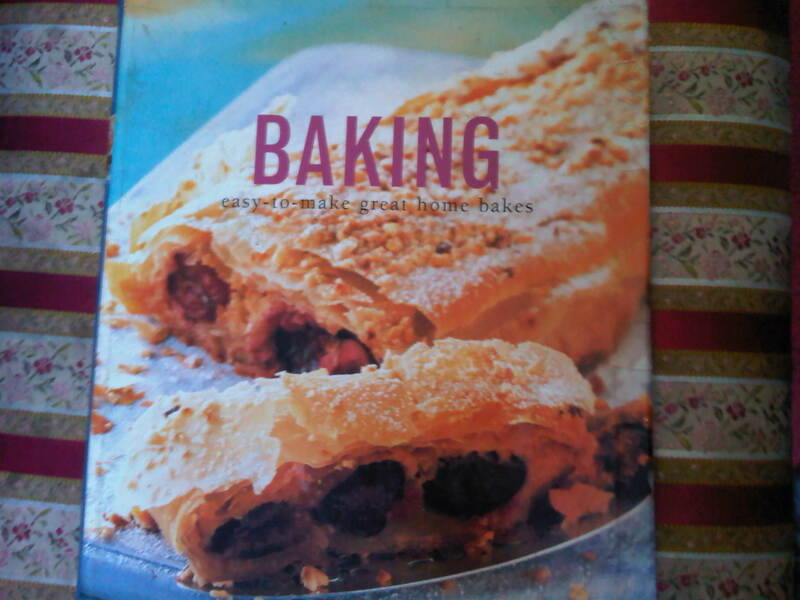 In my last baking related blog ‘Just because it looks like a chocolate brownie doesn’t mean it tastes like a chocolate brownie’, I talked about a missing baking recipe book. This all signing all dancing baking book has been found! Who had it all along? The same person who denied all knowledge about the whereabouts of said book…yes it was my mum. Parents, what can you do about them, can’t live with them, and can’t live without them. This weekend I discovered how much a leak in my roof was going to cost to repair, I’ll spare you the details. Needless to say if I’m to continue to have little sweet treats I’m going to have to make them myself. It works out cheaper and once I master the techniques I’m hoping will taste nicer. I’m also going to need to make full use of my gym membership! With the reappearance of the baking book the banana cake recipe found on Pinterest has been put on the back burner. 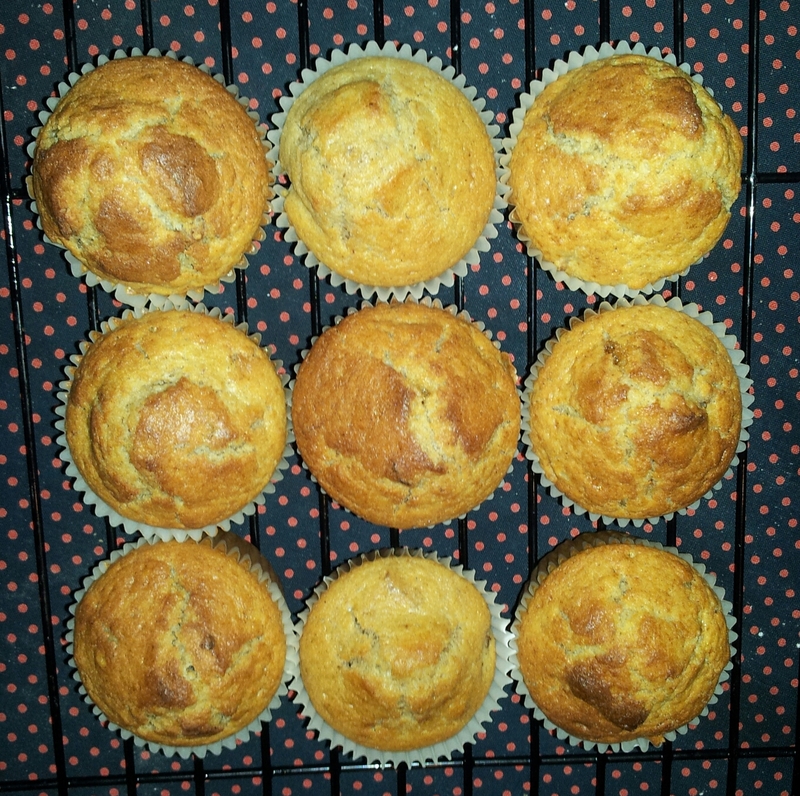 I did still make some banana muffins which turned out quite nice. I thought they were a bit dry but others thought otherwise, I think they were being polite. The problem I have when baking is I can’t eat it all myself and unless my siblings are feeling brave I’m have plenty left over. So I decided to be all caring and sharing. From a batch of 12 I had about 4 left over. Gave 3 to my sister and my parents had one each and I ate 3, leaving me with 4 muffins to test out on the two guys that sit next to me at work. As far as I know they have not suffered and adverse side effects as a result they have agreed to be my guinea pigs for future experiments. My next baking expedition is to be chocolate chip cookies. Wish me luck!